Cars, explosions and mass devastation are what make up a good movie for me. But I too get bored sometime due to overkill. However, Transformers is my type of movie, it has no message, no brain needed to follow with a lot of cars, explosion, mass devastation and my new favorite, invasion of USA. Transformers Dark of the moon had a budget of $ 195 million which used wisely can give us a lot of new footage to feast our eyes however, one youtube user had an eagle eye. 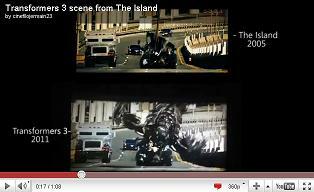 He spotted that Transformer’s director, Michael Bay had used shots from his old movie “The Island” which was released in 2005. As the video below is self-explanatory, I’ll leave you with the clip where CGI has been used to use the scenes from the movie The Island to probably save some production costs. So before you go out and spend money to watch Transformers, just join The Island and other Michael Bay’s movies with previous parts of Transformers and you have Transformers 3.